Devonte Smith and Dong Hyun Ma kick off the main card for UFC 234 which will be a thrilling lightweight contest. Smith is an exciting prospect who has finished all of his nine wins (8 KO’s and 1 submission). With a record of 7-1 he got his chance on Dana White’s Contender Series and seized his opportunity by finishing Joe Lowry with vicious elbows. He then followed this up by starching Julian Erosa on his UFC debut. The experienced South Korean flies over to Australia confident of derailing Smith's prospect and is on a three-fight winning streak himself. After suffering two knockout losses in a row he has bounced back with a decision over Brendan O’Reilly, a TKO over Takanori Gomi and another decision over Damien Brown in his last fight. Ma is very well-rounded with powerful striking complemented by an exceptional level of Judo and he needs to showcase these skills. Ma needs to get his hands on Smith as he is extremely dangerous on the feet. 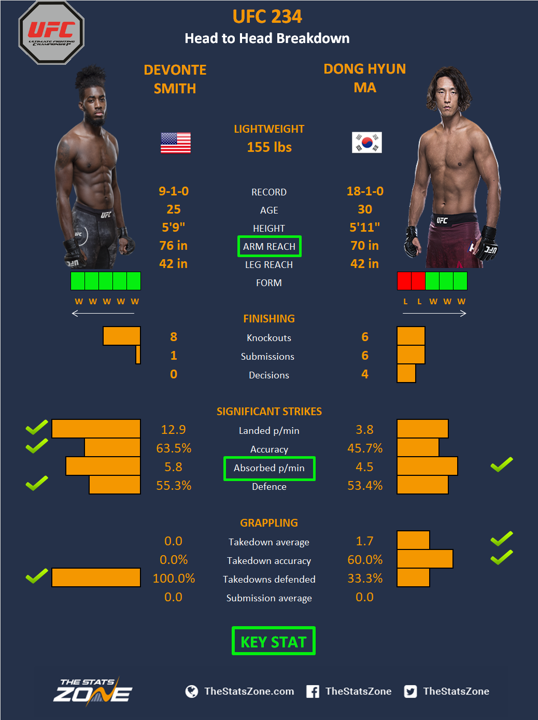 Even though Ma is two inches taller, Smith has a six-inch reach advantage which is likely to make all the difference in the exchanges, and considering his knockout power we could easily see knockout number nine for the American.